I wanted to put this post to address a couple misconceptions of lambic - bitterness and final gravity (FG). Because modern lambic is generally brewed with aged hops, and the bitter alpha acids in hops oxidize with aging, I think there is the idea that lambic receives no or very little bitterness contribution from hops. And with FG I think there is the idea that, due to the long fermentation and diverse range of microbes with a capacity to attenuate a given wort further than normal brewing yeast, lambic is super-attenuated beyond where other beers might be. While there can be some truth to both of these - lambic can be highly attenuated and aged hops used in lambic probably contribute less bitterness than fresh hops would - this line of thinking over-simplifies lambic and potentially makes a caricature of sorts out of its actual characteristics since lambic can and does have bitterness and it may not be more highly attenuated than saisons or certain Trappist beers. This post came together from the overlap of a couple different topics that I'm currently looking into. For independent reasons, I've been spending a fair amount of time over the last month or so thinking about the following: hops in lambic (I owe lambic.info a section on this and should simultaneously update/expand what's on Milk the Funk), final gravities and 'dryness' in beer, and the general brewing process and characteristics of lambic (through a series of interesting discussions with a good friend). I think these topics could see expansion in the future, but for now I'll leave it here. pronounced bitterness than other geuzes. I should note that the following is the range of information I was able to find, but lambic has considerable diversity among the different producers (as well as with atypical batches within a given producer). I've had conversations with blenders and brewers about 'stuck' barrels that wouldn't attenuate further as well as batches that came out more hoppy than intended and, as such, were still forwardly hoppy after 3-4 years. As shown by the ranges presented in Guinard's book Lambic, there are certainly examples of lambic which are more and less highly attenuated and more and less bitter than the following individual data points. So this is not meant to be exhaustive and all-encompassing, but it is what I was able to find in the published literature, from individuals, and from values reported by breweries. One last quick note - I'll somewhat indiscriminately compare lambic and geuze in this post. And when I say lambic I may mean both old lambic and gueuze. I realize that in strict definitions one could argue that I ought to treat them more independently, but with the paucity of data I've combined them here. 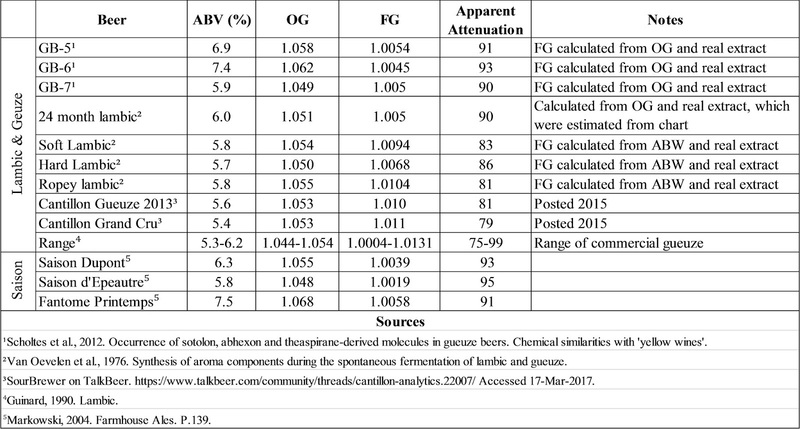 The reported FGs that I've seen for individual lambic and geuze samples range from ~1.005 to around 1.010 and none of the specific examples are below 1.0045. Note that the scientific literature on lambic is based to a fair degree on one producer. 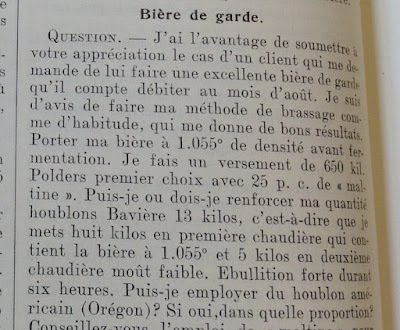 And a case could be made that this producer is not completely representative of other lambic in terms of FG (as well as other characteristics). Anyway, given a FG around 1.005 - 1.010 and a starting gravity in the mid 1.050s, this is an apparent attenuation of about 80-90%. That attenuation is in the range that certain pale ales could fall, and definitely below where some pure culture Belgian beers can be found. See, for example, the saisons presented in the table as well as apparent attenuation of Trappist beers as presented in Brew Like a Monk (where apparent attenuation is generally around 85-90%). Original gravity, final gravity and apparent attenuation for different lambics, geuzes and saisons. 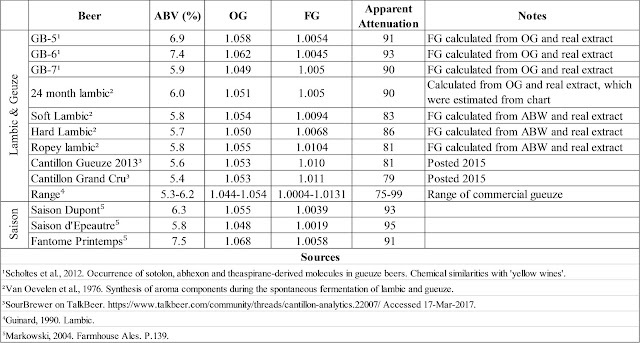 So lambic FGs aren't necessarily very low, and the attenuation is not abnormally high compared to other Belgian beers of comparable OG. Since we know that lambic microbes can ferment carbohydrates than normal brewing yeast can't, this higher FG likely reflects lambic production methods. The mashing process used in lambic is designed to yield a wort with high extraction from the grains but a fair amount of unfermentable material (for more on turbid mashing, see these two blog posts (first and second) on its use outside of lambic, this section on lambic.info and this page on Milk the Funk). Some of the starches and proteins survive lambic fermentation. And in the end they don't contribute much in the way of a perception of sweetness, but there is definitively something left when lambic fermentation is complete. So, in practice, the attenuation of lambic is a balance between production methods resulting in a more dextrinous wort and the super-attenuation capacity of the microbes found in lambic, which may differ brewery to brewery. 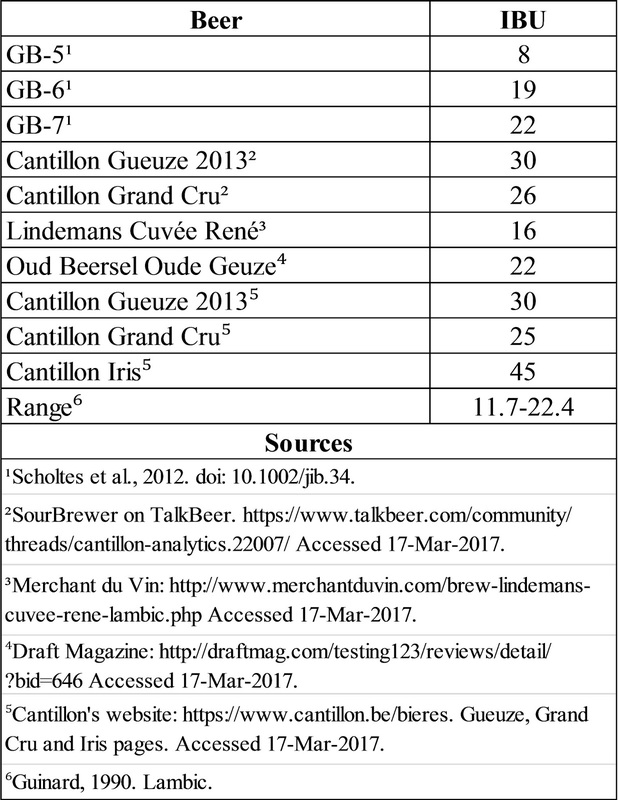 For some more data on lambic FGs check out this post from Kevin (Belgian Beer Geek). Note that the age of the lambic is variable and some are fairly young as the data are from a geuze blending session. But the data are generally in agreement (Cantillon is higher, many around 1.005 or so). The outlier here is Boon, which has a very highly attenuated lambic. I had heard from blenders that Boon finishes quite low so I'm happy to see some FG measurements on it. Modern lambic typically uses aged hops (I've written a bit about historic lambic hopping, where non-aged hops were used, and some modern brews with a bit of non-aged hops here). And in these modern lambics, I get the feeling that popular thought (at least in North America) is that they don't contribute bitterness to the beer. This can be seen, for example, in the IBU range for lambic and geuze in the 2015 BJCP guidelines (note that the GABF guidelines present a more reasonable range). I don't generally take these guidelines to be wonderfully accurate, especially with Belgian beers, but they do show the mentality, accurate or less so, of the people who are involved enough in beer and brewing to make the guidelines. And this thinking is transferred to many who read the guidelines. Measured IBUs in lambics and geuzes (and Iris). As hops are aging, acids and oils in the hops will oxidize. In this way, the alpha acids that generally are thought of as contributing the bitterness to a beer are degraded and therefore aged hops used in lambic will likely not have much in the way of alpha acids to contribute. However, oxidation products of both alpha acids and beta acids can also contribute bitterness to a beer. Dr. Tom Shellhammer (a professor at Oregon State) and his research group do quite a bit of hop research, including about the bitterness of oxidized hop acids. I talked about a bit of this research in this post following CBC 2015, and there is more info in this 2016 paper by Algazzali and Shellhammer. Humulinones (oxidized alpha acids) and hulupones (oxidized beta acids) are about 66% and 84% as bitter as isomerized alpha acids. These oxidized acids absorb light at the wavelength used for spectrophotometric IBU measurements. and therefore they contribute to IBU measurements. It is also relevant here that hulupones absorb much less strongly the primary wavelength used to measure IBUs, and therefore a given concentration of beta acids will yield fewer IBUs than the same concentration of alpha acids when measured spectrophotometrically. Given the relative similarities of the bitterness intensities of hulupones and iso-alpha acids, this may be important in the relative bitterness of beers deriving bitterness more from oxidized acids compared to iso-alpha acids. If you look at measured IBUs in lambic, the values can be fairly high. Especially considering that these are measured IBUs in beers that are multiple years old. I think it is important to remind ourselves that spectrophotometers aren't tongues and they measure the absorption of light at a given wavelength, which is converted to IBUs, rather than measuring the perception of bitterness in beer. So measured IBUs do not necessarily equate to a certain perceived bitterness. Nevertheless humulinones and hulupones are formed by oxidation of acids, are detected by IBU measurements, and give a perceivable bitterness. And this can definitely be detected in certain gueuzes. For example I find Girardin to be fairly hop-forward (at least among lambics). So I think the potential impact of hops in lambic from a bitterness standpoint tends to be overlooked. I don't mean to suggest that bitterness in lambic is high and a prominent character of the beer in all cases, but it is definitely non-zero and in the range of perception. And this, along with countless other compounds from the ingredients/brewing process, fermentation and aging, contributes to the final character of lambic. Furthermore, in the case of some lambics, it might be more forward such that is can be a prominent differentiating character between different producers. To wrap this up, I think both FG and bitterness are overlooked in lambic due to assumptions (very high attenuation and no bitterness) that don't always match the actual characteristics of the beers. Clearly traditional geuze isn't heavy/sweet (I may have a post in the works about FG, so hopefully more on this to come). And it generally isn't bitter in the same way a pale ale might be even though IBU ranges can overlap. So bitterness is generally not a dominant player in lambic, but it is definitely there and it serves a purpose. And, depending on the producer, it may even be fairly apparent. 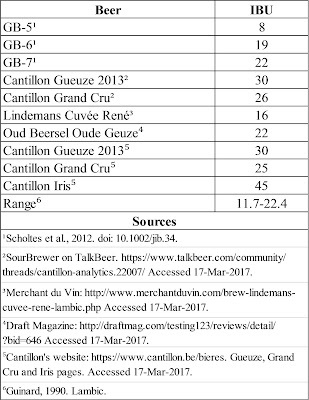 Looking back over these data, there is a fair range of variability across different producers and/or vintages in terms of geuze attenuation and bitterness. Attenuation in traditional bottled geuze can range from near to 100% (choosing the top end of the range presented by Guinard) down to about 80% (looking at Cantillon). This variability in FG among producers will reflect the specific aspects of their turbid mash schedule as well as potentially their regional microbes. And this can make things complicated for lambic blenders, as I've noted previously in this post about Tilquin. If higher FGs are due in part to specific microbe populations, then blending a higher stable FG lambic with a more attenuated lambic may lead to the high FG no longer being stable. This can be quite problematic for carbonation. On the more positive side, blenders can use variability in bitterness to their advantage, blending down bitterness in certain batches and/or from certain producers and using a more bitter lambic to add its character to a blend. I think it is interesting to note that Cantillon tends to fall on the high end of IBU measurements here and it is also a bit higher in FG than others. This could be purely coincidental, but there could also be a couple relationships here. There is the potential for causality. I'm not inclined to put too much stock in this as the lambic doesn't seem to have any problems reaching an appropriate acidity. But it is theoretically possible that certain bacteria with higher hop tolerances and lower ability to break down oligosaccharides are favored over more hop-sensitive and attenuative bacteria. Again, I wouldn't put too much stock in this. Also, the higher bitterness and FG may work to support each other. With more residual material in the beer the bitterness may not jump out as much as it would in an especially low FG beer. And therefore, for the same perception, higher hopping rates/a higher concentration of bitter compounds would be needed. Though it could be simply a coincidence. Finally, and possibly most interesting, perhaps the raw ingredients and mashing process used by Cantillon (which, since they are the most known, are also the most followed by turbid mashing brewers in North America) may be sufficiently different from processes and ingredients used by other brewers to cause these higher FGs. Thanks for reading. That definitely leads to more to look into (especially the final gravities and their reasons). This was mostly a collection of recent thoughts and I expect there will be more thinking about this sort of thing to come. Feel free to add any thoughts of your own here.